Copyright © 1998, 1999 Edgar Rice Burroughs, Inc. and Walt Disney Music Company (ASCAP). All Rights Reserved. Copyright © 1999 Edgar Rice Burroughs, Inc. and Wonderland Music Company (BMI). All Rights Reserved. 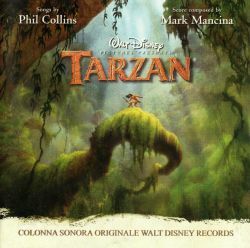 Music Recorded and Mixed at Signet Soundelux Studios, Todd-AO Scoring, Sony Music Studios/NY, The Village, Sony Pictures Scoring Stage, Mancina Music, Inc.
Also contains Tarzan video game demo and Phil Collins interview.